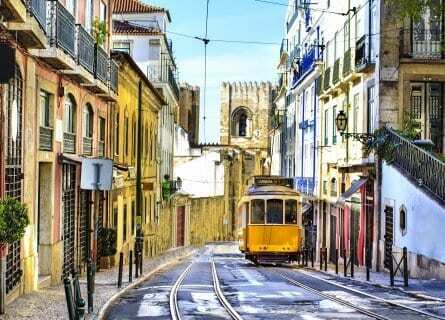 Lisbon is one of the most romantic and enchanting cities in Europe, and a “must do” for food and wine lovers. The city is full of stunning Moorish tilework, medieval cobblestoned streets leading up to a majestic castle, 18th-century palaces (much of Lisbon was rebuilt in the 18th century after the devastating earthquake), San Francisco-like cable cars climbing up the hilly streets, and some superb wine bars and restaurants. Lisbon’s neighborhoods are fascinating and quite varied, from the Arabic Alfama quarter to the jazzy and hip Bairro Alto, to the contemporary, gentrified As Docas area on the waterfront. 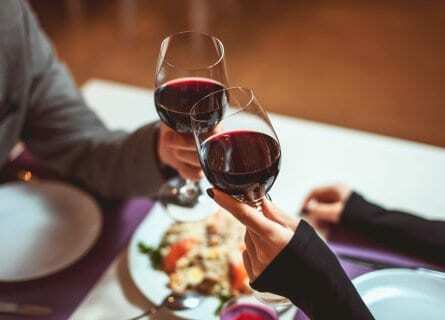 We have created this superb tour in Lisbon for wine lovers seeking luxury, and you can look forward to a range of gourmet experiences including Michelin starred dining in Lisbon; a VIP winery tour at the artsy Quinta da Bacalhôa in Azeitão; exploring Lisbon with your own private art guide and lunching in aristocratic Cascais, overlooking the Atlantic Ocean. 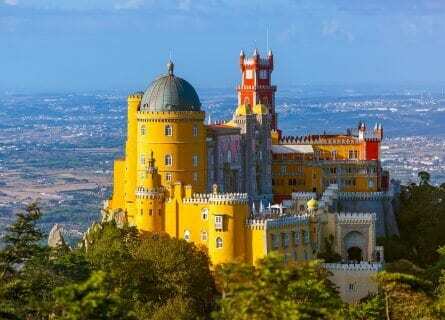 If you would like to spend a few days in Lisbon, taking in the best of the city, staying in a luxurious palace hotel, and enjoying some fabulous food and wine, then contact us for more information about this tour. Gourmet Picnic Lunch with wine pairings and Dinner with wine pairing. Upon your arrival at Lisbon’s international airport, your friendly driver guide will be waiting for you in the arrivals lounge. Transfer to your palatial hotel in the refined Lapa area, one of Lisbon’s most sophisticated neighborhoods. Drop off your luggage, check in and freshen up. Your driver will then take you into Lisbon for a gourmet wine accompanied picnic lunch in the beautiful gardens of a convent. This is a glorious way to unwind after traveling, get some fresh air and settle into vacation mode. After a delicious lunch, you will be ready to stretch your legs, and your own private guide will meet you and take you on a fascinating walking tour. You will see the authentic Alfama quarter with its Baroque Igreja de Santa Engrácia (which took nearly 300 years to build! ), the Moorish Saint George Castle (renamed this after the Moors were conquered) and take in the impressive views beyond the river to the sea from the top. Late afternoon your driver will take you back to your hotel to freshen up and get ready for your magnificent welcome dinner at the super 2 Michelin starred Belcanto. This is by one of Portugal’s celebrity chefs, José Avillez and you will indulge in his tasting menu paired with specially selected wines. And this ends your first day in the stunning “city of light”. Bem Vindos! This morning your chauffeur will collect you and you will head south to Azeitão, on the coastal Setúbal Peninsula near the Arrábida Mountain and national park, where you will be visiting the famed Quinta da Bacalhôa estate. This delightful wine estate is owned by one of Portugal’s wealthiest men, Joe Berardo, who is a major art lover and patron. This becomes apparent when you visit the property, and you will have a VIP visit today. 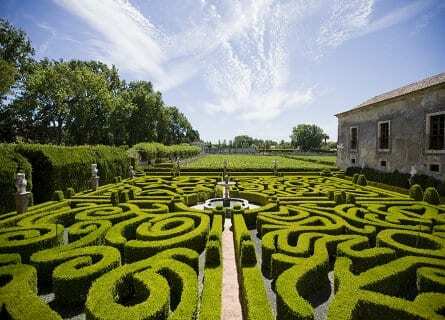 Tour the estate, with its lush vineyards and 16th-century renaissance gardens. Visit their “Azulejo” room, with the largest collection of antique Portuguese tile work in the country. Carry on to the wine cellars and a Japanese garden and conclude your visit with a tasting of their best wines such as the zippy Caterina (oak aged Chardonnay blended with the native Fernão Pires grape) and Palácio da Bacalhôa (Bordeaux blend of Cabernet Sauvignon, Merlot, and Petit Verdot). Following a marvelous morning in the wine country, you will head to the pretty seaside town of Sesimbra, enjoy some free time here for lunch, Sesimbra is renowned for its delicious seafood. Take a digestive stroll along the picturesque bay or soak up some rays. Then it’s back to Lisbon for a private Portuguese Wine Masterclass. This is a fantastic way to get to know the main Portuguese wine regions and your knowledgeable sommelier host has plenty of fun and interesting ways to enhance your discovery experience. The tasting is accompanied by local cheeses, meats, and Portuguese aperitifs so you won’t be terribly hungry for dinner tonight. Why not try a port at the Solar do Vinho do Porto? This is Lisbon’s 18th-century Port Wine Center, and one of our favorite wine bars located in a historic mansion where you can taste hundreds of ports by the glass. And if you do fancy something easy and light, head to the Bairro Alto’s small mom and pop restaurants for “Petiscos” (like Spanish tapas, small portions of rustic dishes). Today is a sightseeing day in Sintra and Cascais. This morning you will drive northwest about half an hour to the dreamy, fairytale-esque town of Sintra. This wealthy and manicured historic town has been the home to Portuguese aristocrats, European nobility and eccentric foreigners for centuries, and its villas and palaces peek out of the lush trees that rise majestically out of the Serra de Sintra. The Ancient Romans used Sintra as a strategic inland base from the coast, and the Moors who followed years later used Sintra as a royal resort. Today we can still admire the Moorish castle, and the breathtaking tile work “Azuelos” which is a legacy they left. You will begin your day with a visit to the extraordinary Palácio da Pena, a castle like no other anywhere in Portugal. Built in 1840 under Ferdinand of Saxe Coburg- Gotha’s patronage, the palace melds Neo-Gothic, Manueline and Bavarian architectural influences into one whimsical Never Never Land. You will explore the gorgeous gardens and admire the fabulous architecture, before moving on to the nearby Monserrate Palace. Enjoy a guided tour around the palatial villa and gardens, built by Sir Francis Cook in 1858. The recent restoration work has brought this abandoned property back to life and is garden lovers heaven – a magnificent setting. You will then head down to the coast where lunch awaits at the Fortaleza overlooking the sea at Guincho. The cooking here is creative, ultra light and inspired in the surrounding natural habitat, you will taste a range of delicious dishes paired with exquisite national wines. Take your time and soak up the beautiful view over the Atlantic. After lunch, you will drive a little further up the mountain to the fascinating Capuchos Monastery. Built into the natural rock and lined with cork, this really is quite something to see and like no other monastery. It was home to Franciscan monks between 1560 and 1834. Then before returning to Lisbon, you will visit Cascais for an intriguing tour of this noble vacation town. You might like to finish this fabulous trip with a farewell drink at the Palacio Hotel in Estoril. Return to Lisbon and your driver will drop you off at the hotel. Cheers, and hope to see you again soon! This morning at your preferred time, your driver will take you to the airport for your outbound flight. And this concludes your fabulous short city break in Lisbon. We look forward to seeing you again!